The project schedule indicates what needs to be done, which resources must be utilised, and when the project is due. In short, it’s a timetable that outlines start and end dates and milestones that must be met for the project to be completed on time. The project schedule is often used in conjunction with a Work Breakdown Structure (WBS) as a way to evenly distribute work among team members. The project schedule should be updated on a regular basis in order to gain a better understanding of the project’s current status. The project schedule is the tool that communicates what work needs to be performed, which resources of the organization will perform the work and the time frames in which that work needs to be performed. The project schedule should reflect all of the work associated with delivering the project on time. Without a full and complete schedule, the project manager will be unable to communicate the complete effort, in terms of cost and resources, necessary to deliver the project. Online project management software allows project managers to track project schedules, resources, budgets and project related assets in real time. The project schedule can be viewed and updated by team members associated with the project, keeping everyone well informed on the overall project status. Work Breakdown Structure (WBS): The building blocks of a scheduled start with a Work Breakdown Structure (WBS). The WBS is a hierarchical reflection of all the work in the project in terms of deliverable. In order to produce these deliverable, work must be performed. A typical approach in developing a WBS is to start at the highest level, with the product of the project. For example, you are assigned as the project manager of a New Product Development Project. The new product you are developing is a new toy for children age’s five through nine. The objective of this product development project is to increase the revenue of the organisation by ten percent. This project plan template can be used to create a simple timeline for your project without all the bells and whistles of a typical Gantt chart. It was designed for creating a visually-appealing project overview with the task descriptions entered within the schedule instead of to the left like in most Gantt charts. This is something you might include in a presentation or use for a school project. This project schedule template provides a simple solution for creating an overview of your next project. This type of project timeline can be useful for presentations or reports where a detailed Gantt chart template may not be required. 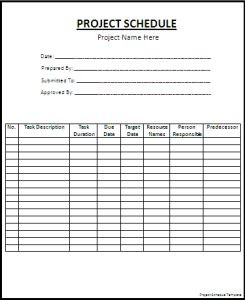 The template includes blank weekly and monthly project schedule worksheets, and the sample schedule worksheet that is shown in the screenshot above. The sample schedule provides some ideas for how to format the worksheet, such as using background colors and vertical text for milestones. But when it comes to creating a project schedule, well, that’s something few have deep experience with.What and who is being scheduled, and for what purposes, and where is this scheduling taking place, anyway? A project is made up of many tasks, and each task is given a start and end (or due date), so it can be completed on time. Likewise, people have different schedules, and their availability and vacation or leave dates need to be documented in order to successfully plan those tasks.Whereas people in the past might have printed calendars on a shared wall in the water-cooler room, or shared spreadsheets via email, today most teams use online project scheduling tools. Typically, project scheduling is just one feature within a larger project management software solution, and there are many different places in the software where scheduling takes place. For example, most tools have task lists, which enable the manager to schedule multiple tasks, their due dates, sometimes the planned effort against that task, and then assign that task to a person. The software might also have resource scheduling, basically the ability to schedule the team’s availability, but also the availability of non-human resources like machines or buildings or meeting rooms. Because projects have so many moving parts and are frequently changing, project scheduling software automatically updates tasks that are dependent on one another, when one scheduled task is not completed on time. It also generates automated email alerts, so team members know when their scheduled tasks are due or overdue, and to let the manager know when someone’s availability has changed. Project scheduling is simple when managed online, thankfully, especially since the software does all the hard part for you! We have a number of schedule templates and calendars that you can download and edit using Microsoft Excel or OpenOffice. A spreadsheet is a great tool for creating a daily schedule or weekly schedule. It’s not too difficult to create your own schedule from scratch, but like most people, you probably value your time and money, so hopefully, our free schedule templates will be just what you need. 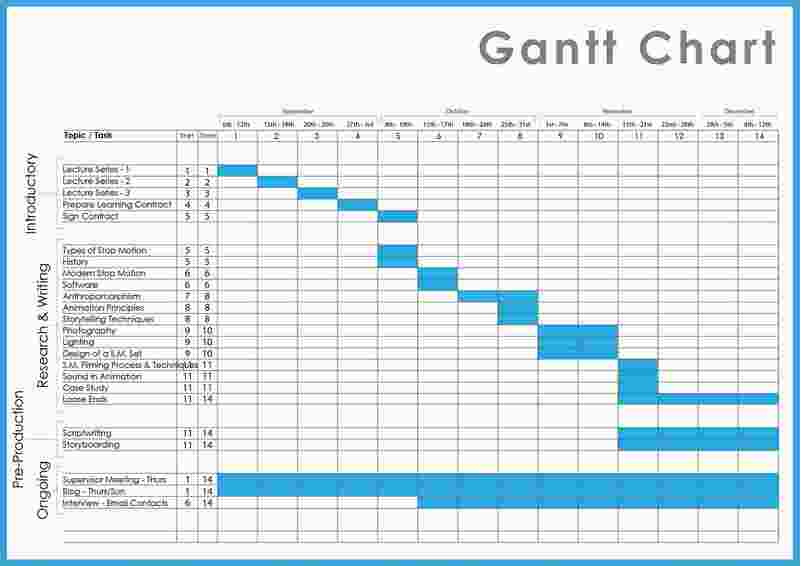 Gantt Chart Project Schedule: This Gantt Chart template is perfect for project scheduling and detailed task scheduling. This template contains the core functionality needed to create a simple Gantt chart easily. Each row of the worksheet represents a separate task. All you need to do is define the start date and duration of each task. 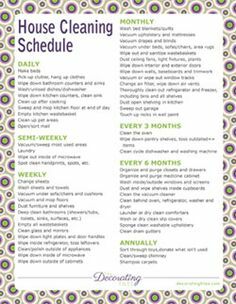 House Cleaning Schedule: Create a 4-week cleaning schedule to print a hang on your fridge. This cleaning schedule template gives you a lot of flexibility to say exactly what you plan to do each day of the week, for 4 weeks (a month). You can also list daily and monthly reminders. 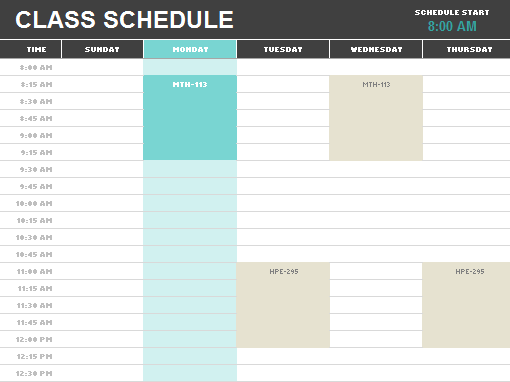 Class Schedule: This class schedule is essential for any college student. Use it to help you plan your weekly class schedule for a new semester to ensure that you don’t accidentally overlap your work, classes, training times, etc. This spreadsheet contains two worksheets. One includes the main hours of the day divided into 30-minute intervals (allowing you to show more hours of the day), and the other has the hours divided into 15-minute intervals (allowing you to be more detailed). 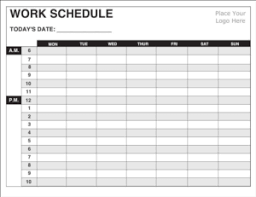 Work Schedule: This work schedule template is designed to let you print two weeks at a time. Easily modify the template for night shifts or other shifts. Includes mini monthly calendars for convenience in planning. 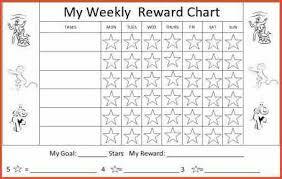 Weekly Reward Chart: Download a weekly reward chart for tracking progress on chores, practice, or other tasks. The screenshot shows tables in multiple colors, but that is just to show how you can change the color scheme easily by modifying the theme or table designs. In addition to a weekly reward for each task, you can list bonus rewards for total # of stars. 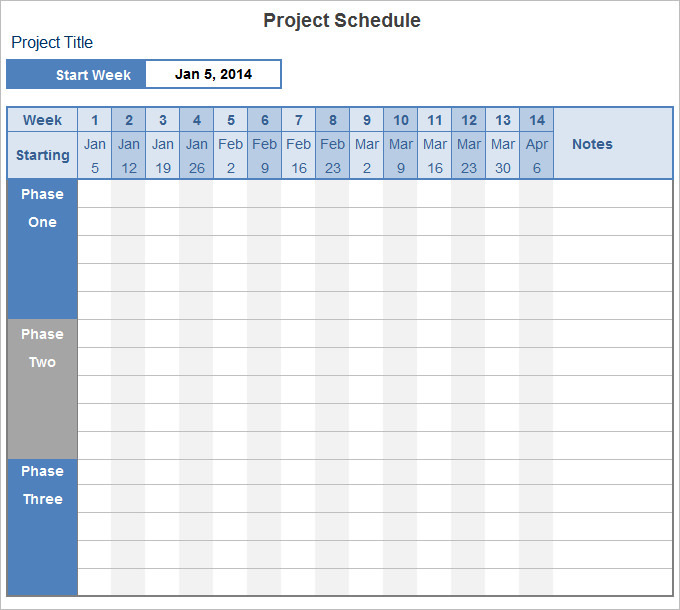 Project Schedule Template: Create a simple project schedule in Excel with just some basic cell formatting. This project schedule template provides a simple solution for creating an overview of your next project. This type of project timeline can be useful for presentations or reports where a detailed Gantt chart template may not be required. Weekly Schedule: This weekly schedule is a generic version of the class schedule template listed above, but not as complicated as the weekly calendar. This spreadsheet includes two different weekly schedule worksheets. The first one is designed for 15-minute intervals and the second one has 30-minute This is a very basic schedule template and easy to customize. Appointment Schedule Template: Use this template to schedule and track appointments on a daily/weekly basis. This template was designed to help you schedule and follow up with appointments. Begin by choosing a start date and start time and a time interval (such as 15 minutes or 30 minutes). Then, make a copy of the Schedule worksheet before you begin creating your schedule. Why we need a Project Schedule templates? Financial: Project scheduling impacts the overall finances of a project. Time constraints require project managers to schedule resources effectively. This is particularly true when resources must have highly specialized skills and knowledge in order to complete a task or when costly materials are required. Completing a project in a short time frame typically costs more because additional resources or expedited materials are needed. With accurate project scheduling, realistic estimates and accurate projections prevent last-minute orders that drive up costs. Documentation: Creating a comprehensive work breakdown structure allows you to create a chart, such as a Gantt chart, that lists the project tasks, shows dependencies and defines milestones. Management consultant Henry Gantt designed this type of chart to show a graphic schedule of planned work. Its role in business projects is to record and report progress toward project completion. Your project schedule also allows you to assign human resources to the work and evaluate their allocation to ensure you have the appropriate levels of utilization. You may also develop a program evaluation and review technique chart, or PERT chart, to help you analyze project tasks. Management: Effective project managers conduct regular meetings to get status reports. They use project scheduling meetings to check in with their team members and prevent costly misunderstandings. These regular meetings ensure that work flows from one process to the next and that each team member knows that he needs to do to contribute the project’s overall success. Quality: Project scheduling ensures one task gets completed in a quality manner before the next task in the process begins. By assuring that quality measures meet expectations at every step of the way, you ensure that managers and team members address problems as they arise and don’t wait until the end. No major issues should appear upon completion because you’ve established quality controls from the very beginning of the scheduling process. Effective project managers understand that ensuring quality control involves managing risks and exploiting opportunities to speed up the schedule when possible to beat the competition and achieve or maintain a competitive edge with a more reliable product. Managing the tasks, resource and time for executing and completing more than one Project are called Multiple Project Tracking. 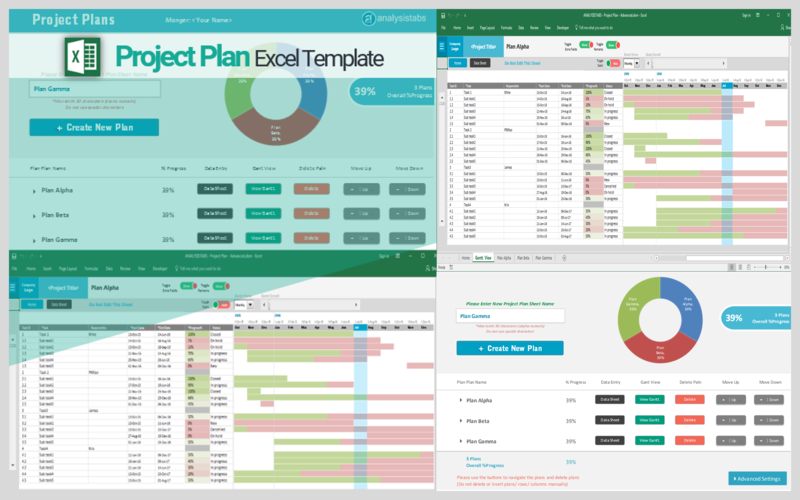 We can use Excel Templates to effectively Plan and schedule multiple projects in a single spreadsheet. Elements in Multiple Project Tracking Excel Template: Here are the most important elements in the Multiple Project Tracking Template. We must include these elements for effectively manage and track the tasks of multiple projects. Multi-Project Selector: Drop-down list to select a required project from the list of projects. You can select All Projects or any one project to see the respective Task and details. When you select All Projects in the drop-down list, it will consider all the tasks and projects in the data sheet. If you choose any one project, this will populate the summaries of respective project. Multi-Project Summary: This will provide the status of the multiple projects at one glance. You can add new projects and manage the project labels here. This will update the Project Summary Chart automatically. High-Level Project Status: This helps quickly to see actual project start and end dates including % of work completed. You can also add a total number of hours required or a total number of FTE working on each Project. Multiple Project Tasks by Status: Here you can see the number tasks with a different status of the Projects Tasks. We have given Tasks with 0%, these are new tasks and not yet started. Tasks between 1% and 25% Progress, these tasks are started but an initial phase. And Tasks between 25% and 50%, tasks which are completing half of the work. Task between 51% and 75% Task completed half of the work. Tasks between 76% and 99%, Task completed most of the work and in the final stage. And finally, Task with 100% completion, these are the task completely developed. Multiple Project Tasks Scroll Bars: We have provided Two Scroll bars to scroll the items on Gantt Chart Area of Multiple Project Template. You can use Horizontal Scroll bar to scroll the Time frames (days). And You can use the vertical scrollbar to scroll the items or records on the Gantt Chart. So, using these two controls, you can see all data of any required project. You can add more controls to see the Project Gantt Chart By Day, Week, Month, Quarter and Year. These are advanced options of Gantt Chart, very useful when we have a number of tasks. 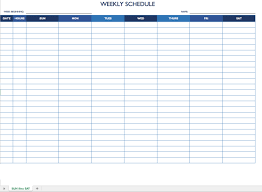 Bi-Weekly Work Schedule Excel Template: Adjust the date and starting time on this bi-weekly work schedule template to create a custom calendar. 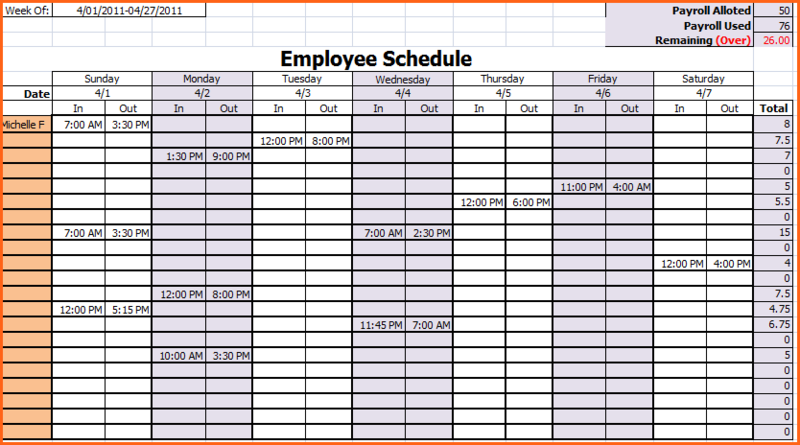 Keep track of your own work schedule, or use this template to plan employee shifts. 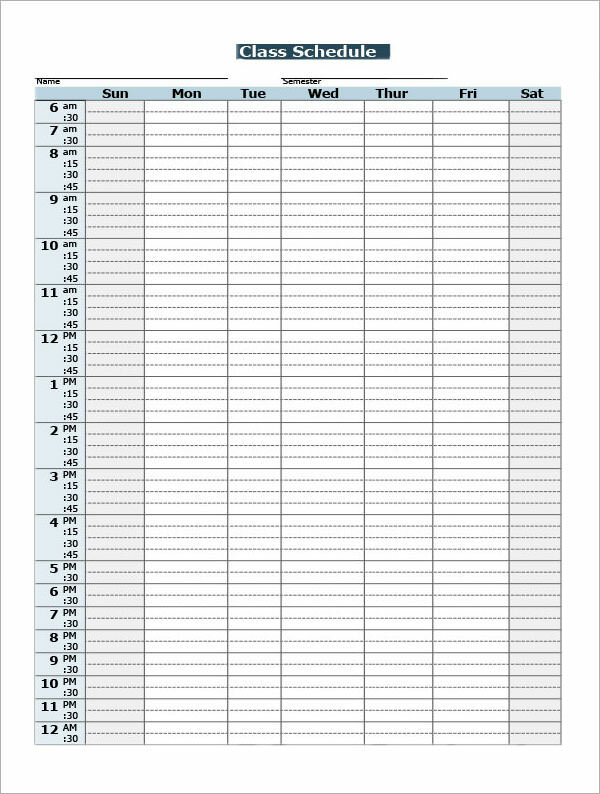 Employee Schedule Excel Template: In addition to scheduling shifts for employees, this free template allows you to track work hours and labor costs. 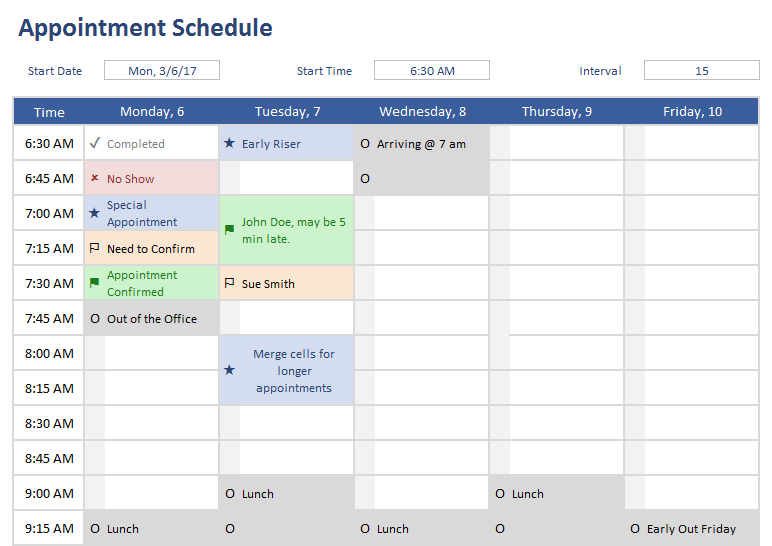 Create a simple yet functional weekly employee schedule to streamline your business organization. Weekly Report Excel Template: Document progress and concerns for ongoing projects with this weekly report template. Get status updates from employees, create weekly reports for your boss, evaluate activities in the process, and get feedback from team members. This simple template can be an important and effective communication tool. Excel Weekly Schedule Template, Mon-Sun: This blank weekly schedule template provides morning, afternoon and evening time periods for a full week, starting on Monday. Stay organized with this basic weekly calendar template. Excel Weekly Schedule Template, Sun-Sat with 30-minute Intervals: Plan each hour of your day with this weekly template showing 30-minute intervals. Organize your work day, create a personal planner, schedule family activities, or print the template to use as a simple weekly calendar. 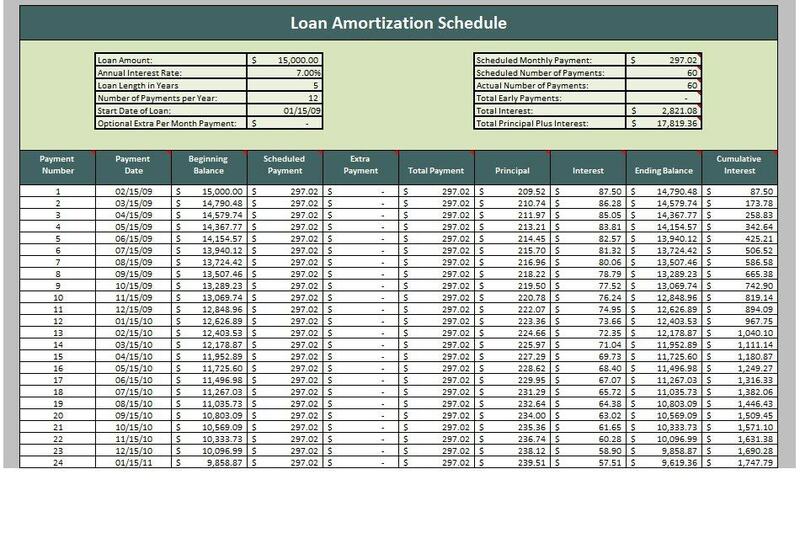 Loan Amortization Schedule Template: Track payments for a business loan, mortgage or another type of loan with this amortization schedule template. You can see how payments are applied to interest and principal, as well as the remaining balance on the loan. Bill Payment Schedule Template: This bill payment schedule shows when each bill is due and the monthly total spent on bills. Keep track of where your money is going each month, and make sure your bills get paid on time. Weekly Planner Template: This weekly planner template makes it easy to see your week at a glance, with room for notes and priority tasks. This is a simple choice if you’re looking for a free, printable planner. Keep track of birthdays and events, create a to-do list, and plan for each day of the week. 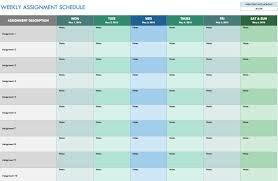 Weekly Assignment Schedule Template: Stay on top of multiple assignments with this weekly assignment schedule template. 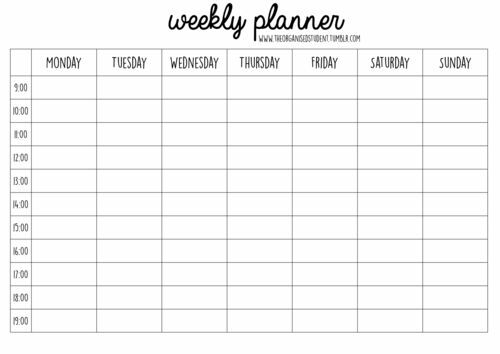 The simple layout makes it easy to plan your week and manage each stage of a project. 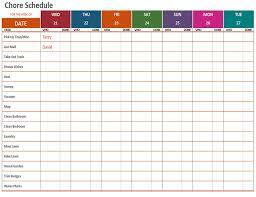 Student Schedule Template: School days just got a little easier. 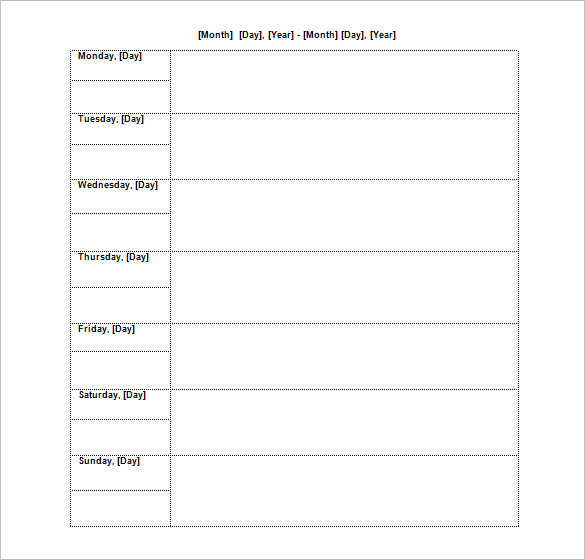 Students can plan their weekly schedules with this simple template, keeping track of class times, extracurricular activities, a work schedule, or any of the important aspects of a busy student life. 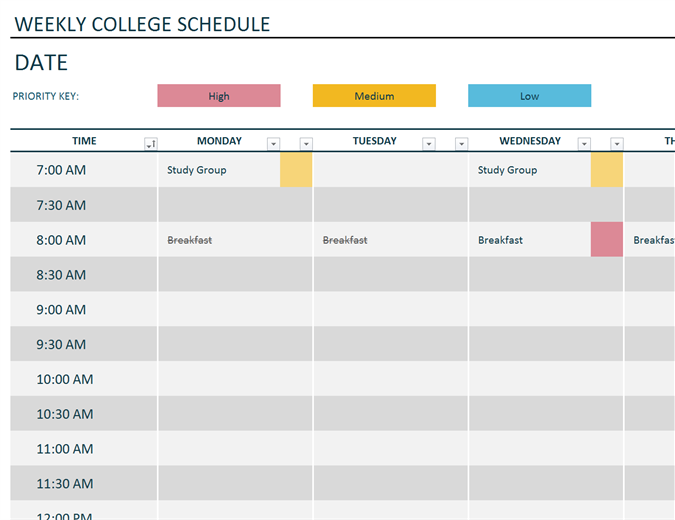 Weekly College Schedule Template: If you’re a college student with a busy weekly schedule, use this template to stay organized and keep track of classes, study groups, events and other activities. 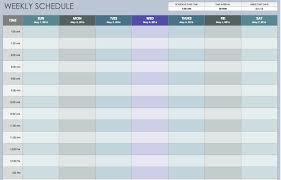 Organize your college schedule by time, day and priority. 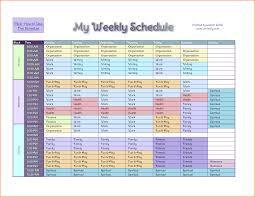 Class Schedule Template: All students can benefit from a weekly class schedule template. It’s easy to plan for the week and create a daily routine based on a class schedule. Create time for studying, scheduled meal times, and add any other important weekly obligations. 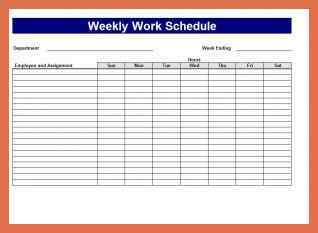 Weekly Homework Schedule Excel Template: This homework schedule template may not keep you from procrastinating, but it will help you stay organized throughout the week. 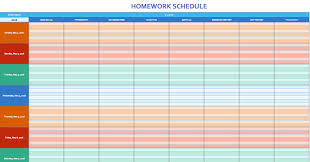 Track your homework assignments for each class, and record which items have been completed. 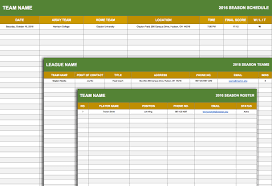 Sports Schedule Template: This sports schedule template is a roster and schedule in one. Coaches can easily access contact information for team members, scheduled game days, and keep track of league teams. 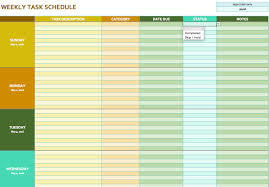 Weekly Chore Schedule Template: Assign household chores to family members or housemates for each day of the week. This weekly chore schedule template shows morning and evening chores in a basic format that’s easy to read. Doing chores may not always be fun, but using a template can help ensure they get done. Weekly Task Schedule Template: Keep track of your weekly tasks with this free template. Whether you’re scheduling errands, appointments, chores or other tasks, this template shows which items have been completed and which are still pending. Think of this as an Excel version of a weekly to-do list. Weekly Agenda Template for Word: Review business goals, track ongoing action items, address new agenda items, and plan for future meetings with this weekly agenda template. If you have a recurring weekly meeting, this free template is an easy way to organize your weekly agenda and provide meeting notes to team members.